Prosecutors Thursday also postponed the arraignment of the suspect whose alleged attempted robbery led to the shooting of Sgt. Matthew Gorman and the death of Det. Brian Simonsen of Calverton. This story was reported by Stefanie Dazio, Anthony M. DeStefano, Alison Fox, Deon J. Hampton, Chau Lam and Ellen Yan. It was written by Dazio. An NYPD sergeant from Long Island — who survived a friendly fire shooting in Queens that killed a detective — was released from the hospital Thursday, shortly after prosecutors postponed the arraignment of the suspect whose alleged attempted robbery prompted the ultimately fatal police response. The Calverton family of Det. Brian Simonsen, meanwhile, spent the day planning the 42-year-old’s funeral services next week. 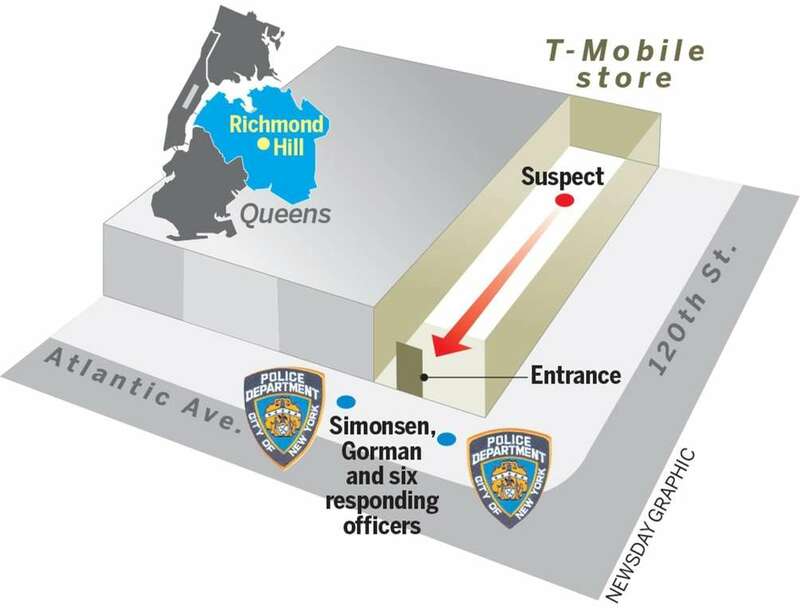 The detective from the 102nd Precinct was shot in the chest and killed as he and fellow NYPD officers confronted the robbery suspect, Christopher Ransom, inside the T-Mobile store on Atlantic Avenue and 120th Street in Richmond Hill on Tuesday evening, police said. The NYPD on Thursday also released the first image of the fake pistol that Ransom, 27, allegedly brandished and simulated firing at police in the attempted robbery, prompting seven officers — including Simonsen and Sgt. Matthew Gorman, who was shot in the leg by the friendly fire — to fire 42 rounds, police said. 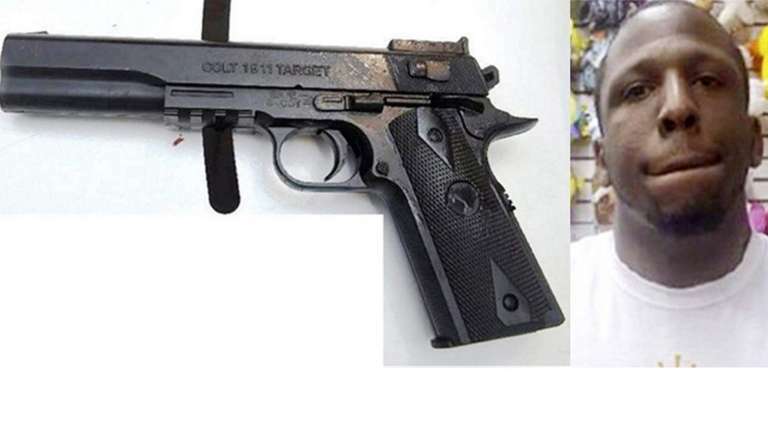 The imitation black handgun has “COLT 1911 TARGET” stamped on its left side, and the usual orange cap on the barrel for such imitation guns is removed. Online store listings for this type of fake gun show that they fire BBs. 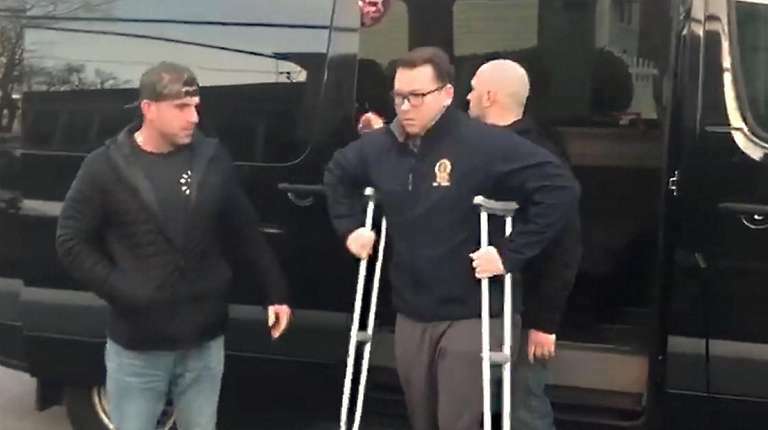 Gorman, who had been investigating an unrelated robbery pattern nearby with Simonsen at the time, returned to his home in Seaford on Thursday afternoon on crutches. His release from Jamaica Hospital Medical Center was without fanfare at the family’s request, according to NYPD officials. Ransom, who was shot by police multiple times, has been charged with murder, robbery, assault, aggravated manslaughter and menacing. Sources say his hospital bed arraignment was postponed due to a medical emergency, possibly an infection. It was unclear when the arraignment would be rescheduled. Police have called Ransom a career criminal with 25 prior arrests, including a case in Brooklyn where he allegedly impersonated a police officer. But outside his former Brooklyn home Thursday, neighbors said Ransom was “not the monster” that he is being made out to be. Residents said he lived there with his mother, Gloria, before moving away in recent months. 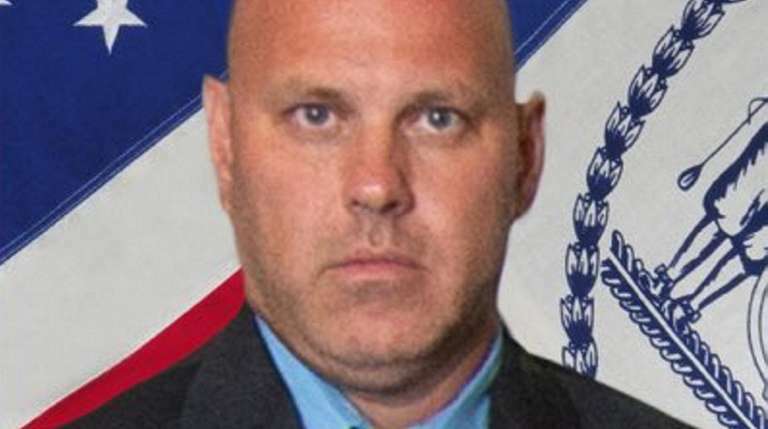 On Wednesday night, Simonsen's body was taken to a Mattituck funeral home by an NYPD procession via the Long Island Expressway. Fire departments lit up overpasses with their trucks and some hung American flags from their ladders. 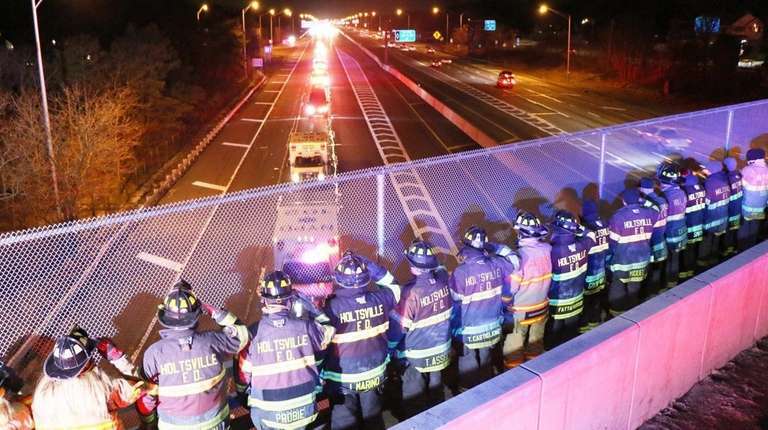 First responders and residents lined the route from Riverhead to Mattituck, said funeral director Joe Grattan Sr. of DeFriest-Grattan Funeral Homes. Simonsen's body was unloaded from an ambulance in front of saluting officers, with those who were wheeling the stretcher into the funeral home holding their hands over their hearts. 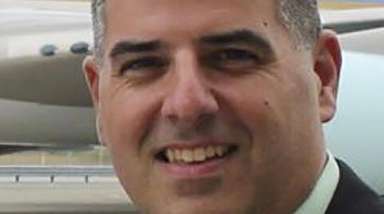 A police helicopter flew over the emotional scene, Grattan said. "That was very impressive, to say the least," Grattan said. "Route 25 was just lined with cars." Simonsen’s wake and funeral Mass will be held next week. Grattan said the funeral home is working closely with police. "We key off of the police department because they are so well-versed in this," Grattan said Thursday. "If they tell us to go to the left, we go to the left." Southampton Town Police Chief Steven Skrynecki said his department would be working with the NYPD and other local departments to coordinate public safety during the services — such as traffic control and parking — because 5,000 to 10,000 people are expected to attend. Police unions statewide have pledged their support for the Simonsen family, including donations, flowers and uniformed ceremonial details who will attend the services. Simonsen’s widow will receive $25,000 from the New York Police and Fire Widows’ and Children’s Benefit Fund, a nonprofit that helps the families of emergency responders killed in the line of duty, as well as an annual stipend, said executive director Lauren Profeta. “When the cameras go away and the city’s kind of moved on, we want to make sure we’re there to help them,” Profeta said. Riverhead Central School District held a moment of silence for Simonsen, a 1995 high school alumnus, Wednesday night at its Black History Month celebration, officials said. Scott McKillop, a high school social studies teacher for 30 years, said he taught Simonsen as a sophomore and coached him in football and baseball. McKillop said he sometimes ran into his former student around town and played softball against him years ago. 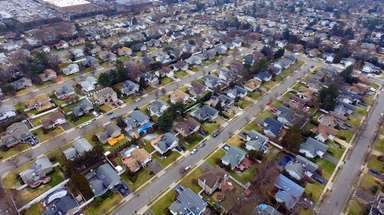 "It definitely left a hole in the Riverhead community," he said. "You want the definition of a great guy, it's Brian Simonsen." 911 call is made about a robbery at a T-Mobile in Richmond Hill. An armed, masked suspect has gathered the employees at the back of the store. Sgt. Matthew Gorman and Det. Brian Simonsen, who were nearby in plainclothes, arrive along with six uniformed officers. Gorman and two uniformed cops enter. Suspect, identified as Christopher Ransom, runs toward the officers with a gun raised. Gorman and the two officers exit store. As the suspect nears entrance, police outside open fire. Forty-two shots are fired. Simonsen is hit in the chest and later dies. Suspect Ransom is struck several times, and Gorman is shot in the leg. There will be a wake Monday from 7 to 9 p.m. and on Tuesday from 2 to 4 p.m. and 7 to 9 p.m. The Liturgy of Christian Burial will be celebrated on Wednesday morning at 10 a.m. All services, including the wake, will be held at St. Rosalie Roman Catholic Church, at 31 E. Montauk Hwy., Hampton Bays. Interment will be at the Jamesport Cemetery following the funeral Mass. The DeFriest-Grattan Funeral Home in Mattituck is assisting the family.